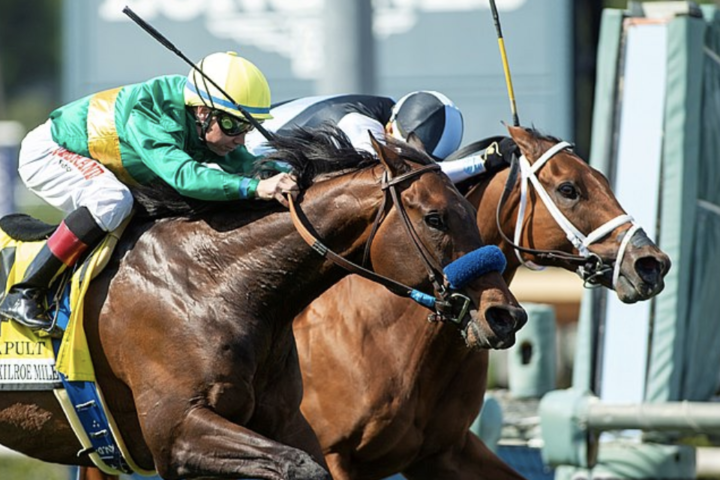 A calculated move by Drayden Van Dyke put favored Catapult in position to do his best running March 30 in the $400,000 Frank E. Kilroe Mile Stakes (G1T) at Santa Anita Park, but it was the 8-year-old former claimer Ohio who held safe in the shadow of the wire. Information provided by Equibase at time of entry. Elusive Quality stood at Darley for $30,000 (2017). Claimed for $50,000 by McCarthy for Eclipse Thoroughbred Partners and Bruce Treitman June 10, Ohio was making his first start in a grade 1. With jockey Ruben Fuentes in the irons, the Elusive Quality gelding settled off the pace set by Hunt, took over off the turn for home, and had just enough to hold off Catapult by a nose. In what appeared to be a paceless race on paper, Hunt, who broke from the rail, took the Kilroe lead away from Ohio as the field began its run up the backside. Hunt enjoyed a one-length advantage heading into the far turn, but Ohio passed him a quarter-mile from home and then held off what appeared to many as the winning charge of Catapult, the 4-5 favorite in the six-horse field. “The instructions were to grab the lead if nobody wanted it, so I jumped out of there and as soon as Hunt went by me, I knew we had something to run at and someone to follow,” said Fuentes, who was riding in his first grade 1 event. “We were going pretty smooth there (following early fractions of :23.98 and :47.39). Coming into the turn, he wanted to go on his own, and (before the race) Mike said, ‘Whatever you do, don’t take anything from him. Whatever he wants to do, go along with it,’ and that’s just what I did. The final time was 1:33.71. Aboard Catapult, who was a close second two starts back in the Breeders’ Cup Mile (G1T) and fourth over yielding turf in the Jan. 26 Pegasus World Cup Turf Invitational Stakes (G1T) at Gulfstream Park, Van Dyke thought he’d won. It was 1 3/4 lengths back to Desert Stone, who prevailed in a nose photo over 5-2 second choice River Boyne for the show. Off at odds of 9-1, Ohio ran for as low as a $28,000 tag last summer. He was second in the Feb. 9 Thunder Road Stakes (G3T) and started his season with a victory in the Jan. 12 Cotton Fitzsimmons Mile Handicap at Turf Paradise. He picked up $240,000 for the win, increasing his earnings to $488,065 and his record to 9-4-2 from 26 starts. He was bred in Brazil by Fazenda Mondesir out of the Nedawi mare Etoile Blanc. “This horse is very easy to train,” McCarthy said. “We put a couple of easy works in him, and he was ready to go. I thought with the small field that we could take a shot. I just thought he was a horse with a lot of back class, and when we took him to Arizona and he won a nice little race (the Cotton Fitzsimmons Mile), it sort of changed him.